The first time I heard it was in the instant after I had first experienced silence. We came here a few months after our baby was born. I left him and his exhausted mother to sleep and set out up the road to find an open place to walk. 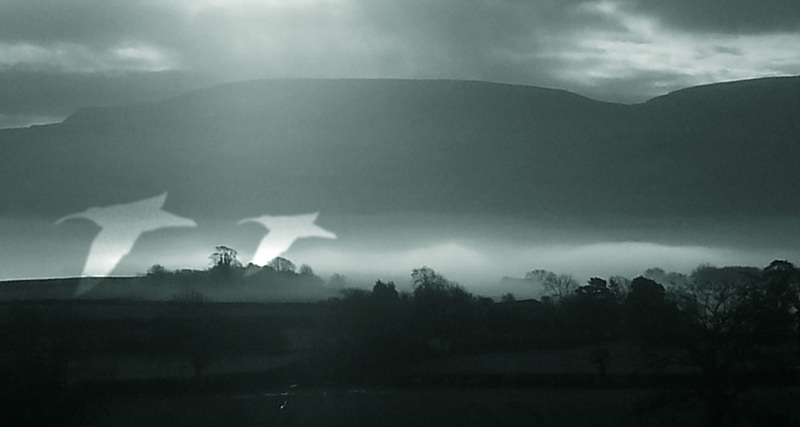 Early April, mist feathering. I could hear the chain clank of a tractor getting louder. Its headlights appeared, coming across the moor. The farmer put his thumb up as he passed. I climbed a rise as the clatter quietened, the sound disappearing fast as if the tractor had hit quicksand. The etymology of the word silence goes back to the Latin word silere “be quiet or still”. It is not possible on this earth to be in a place of total silence, a layer of sound will always unfold from the depths. But quiet and stillness exist, particularly in natural places, though they are hard to find on these crowded islands. I walked along a track between bracken stubble, over puddled mud and blankets of moss. Every few minutes I stopped. The moor was focused and blurred by the movement of mist. Once or twice rooks called. Then nothing for minutes on end. The low light, scoured landscape and quiet were so disconcerting for a person who had just spent ten years in inner city London that I cut the walk short and turned back. Then, for the first time, I heard a curlew. A cold and sour mountain flute. The curlew’s call is often associated with pain and isolation. Though the two birds are unrelated the nocturnal bush stone curlew of Australia has a call very similar to that of the eurasian curlew. There are many aboriginal creation stories about the bush stone curlew but perhaps the most powerful is the creation myth that tells of Ouyan the Curlew who was tasked by his family to go out each night and bring back the meat of an emu. He was a poor hunter and could not approach the swift creature. Being ashamed of his lack of skill he spent the night cutting strips of flesh from his own legs, bringing them back each morning for the meal. Hence the curlew’s wailing cry and stick thin legs. In the lee of the hill, hidden in a copse, half a mile from the spot where I heard my first curlew, is the Church of Little St David’s. It dates back over a thousand years and was originally a hermitage. There are many such chapels in the Welsh uplands, lonely and abandoned. Its graveyard still holds the bare rocks that were taken from the hill by the poor to be used as their dead children’s headstones. Many of those parents would have held the belief that the curlew’s cry was a herald of death. Its call after dark on winter nights resembled the yelping of a pack of hounds and would have been unnerving to most in this area where the legend of the Black Hound is still prevalent even in the 21st century. In other places and cultures their call represented the coming of storms. Some fishermen would turn their boats back if going out to sea and a curlew called overhead. I have never heard them in winter and I do not associate their calls with any form of foreboding. To me, the first curlew call represents the end of the long upland winter, the coming back to life of the moor. When the curlew arrives, other birds are on their way. On the small lake locals call the Monk’s Pool, two swans return to breed. Black-headed gulls are coming into their summer plumage, teal and tufted ducks are passing through. Breeding toads appear along with otter spraints. Those first few weeks of walking on the moor also introduced me to lapwings. There was a flock of about fifty that spring and I spent hours watching their flip-swoops and dives, staring through my binoculars at their emerald to byzantium purple colours, listening to their strange calls like short wave radios tuning to distant signals. The second year the flock was about twenty birds. The year after two pairs returned. Since then, nothing. When humans abandon a place, their remains can be found for centuries afterwards. A three mile walk across the moor brings you to Pentre Jack, a medieval settlement on an exposed ridge facing west. This is a favourite place for juvenile ravens in October when the westerlies scoop them up in pairs and they ransack the sky above the ruins. For years I walked past the settlement not knowing it was there. Then, on an evening of low sun, I saw the long, parallel shadow lines of field enclosures. A closer look revealed hut circles, doorways, livestock pens. It was easy to picture those people, to understand a little of the difficult lives they lived up here, though they have been gone now for a thousand years. What remains of the lapwings who have been gone for only a few? An image fading in the memory of the upland farmers, most of them in late old age and also about to leave this land. What will the curlews leave behind when the last of the breeding pairs here fail to return? In a 2009 interview by the BBC World Service, the sound ecologist Dr John Levack Drever was asked which sounds in our environment he would consider endangered. He listed: typewriter, slam door trains, news vendors’ cries, the bells of Routemaster buses, traditional woodcutting and scrap-metal merchant’s trumpet. Only one of these sounds is more than a century old. He goes on to say how the loss of certain sounds in the environment are a source of lament and lists his own sense of loss at the disappearance of a certain gun retort that announced the hour of 1pm over Edinburgh. How long have the curlews been part of our soundscape? The eurasian curlew is not a threatened species. Its range is huge. Curlews breed as far east as Siberia, down to the Mediterranean and far beyond, being winter visitors to Namibia, Botswana and South Africa. In many areas their numbers are stable and in some they are even increasing. But in the British Isles they are declining rapidly. In this area 110 curlews were recorded in September 1979. In September 2014 there were 29. This correlates with the estimated 80% decline in the species throughout Wales in this period. How do we visualise declines in species numbers? Most of us see a bar chart in a newspaper or TV report. A 20% decline seems significant but perhaps not too serious. For a 50% decline we see that missing half more clearly, perhaps we visualise a half-empty bottle. What we don’t see is the valleys, moors and woods emptying out, silent spaces reaching towards each other, connecting, growing. It is mid-April. We have had 2 weeks of warmth and the hills are exploding into life. On the 3rd of the month I heard my first curlews, off to the south, distant. I didn’t see them. Since then I have heard them a few more times, always in the same place, a group of fields that are not being used to graze sheep at the moment. I hope the birds are nesting in good cover away from the eyes of crows and the increasing numbers of red kites that may account for the most recent drop in their numbers. The initial reduction in the 1980‘s was mainly due to changes in farming practices: the introduction of silage which is cut in May instead of hay which is harvested later in the summer when curlew chicks are bigger and mobile enough to evade the machines. Now it is thought that the continuing decline is caused by predation of eggs and chicks as there are no longer enough birds to see off roaming crows and raptors. But if they find a good spot, the nests are hard to find even for corvid and raptor eyes. An old Welsh story about St Beuno tells of how the saint used to cross from the mainland to Anglesey to preach to his congregation. Instead of taking a boat, he simply walked across the water. On one trip home he became wrapped up in thought and dropped his precious book of sermons into the water, which disappeared under the surface. On reaching land he walked up onto the beach to find a curlew standing guard over the book which it had placed to dry out on a stone. The saint then prayed to the creator requesting that its eggs would be difficult to find. For centuries the prayer seemed to retain its power and curlews were prevalent all over Wales. But the prayer seems to have lost its power in the modern age. At Llangorse Lake there are information signs telling visitors to look for flocks of curlews feeding up on worms for the breeding season. There is a lot of cover here, many acres of unfertilized and undrained fields, traditionally grazed to preserve wild grasses and the wildflower meadows which are just beginning to flood with colour. I cross a stream teaming with red-finned roach and spend hours in a hide over the reed beds which purr and chatter with the sound of water rails, warblers and buntings. On the surrounding pastures there are redstarts and wheatears, a hoard of canada geese. Out on the water there are crested grebes, black-headed gulls, cormorants, coots and moorhens. Herons sail-row above the reeds like viking longships. The whole place is a factory of bird-sound. I cannot hear curlews. Rhulen Hill is a grouse moor covering thousands of acres stretching from the Herefordshire border to the rocks and caves at Aberedw. The whole area is optimized for ground-nesting. There are short-eared owls breeding here in the heather and bilberry as well as black grouse. It is a depressing place, the land dark and undulating like rows of swells coming in from a cold ocean. Red Kites roam low over the moor. Skylarks and a pair of ravens, a single kestrel suspended and flickering. There is a high escarpment of mudstone stacked like teetering towers of books where a pair of peregrines are nesting. I try to approach them slowly and sit at the foot of the cliff listening to their screes until the tiercel spurts out and circles me. In the single blackthorn tree at the foot of the cliff a crow sits on its eggs, a glistening sloe eye against the dark knot of its nest. I wonder how curlews manage to breed here without being seen by the raptors who seem to have every inch of the place covered with their search glares. Hours later, freezing and heading home I see them, a single pair, calls shivering as they land in the heather and stand for a time profiled against the skyline. One is much bigger than the other, a female and male. They don’t stay, in a few minutes the male leaves, crossing low over the cliffs, beneath the tiercel peregrine which has just reappeared. Thankfully the falcon is not hunting and the female curlew follows, piping loudly after her mate. I go home smiling. As I walk into the wind blowing out of the east where the curlews are still holding on I imagine the day, one, five or ten years from now: It will be late May and silence will have spread another ribbon across this island. The bracken returns, everywhere the ground opens releasing question marks.